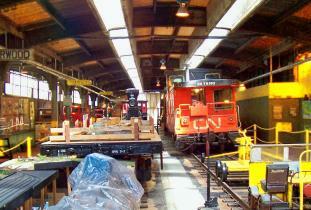 Walk the historic platforms of the Winnipeg Union Station train shed. View railway artifacts from yesteryear and the first steam locomotive on the Canadian prairies, "The Countess of Dufferin" that arrived in 1877. Follow the development of the railways with the displays and rolling stock into the start of the diesel era. Gift shop. Open May 1 to October 31, Tuesday to Sunday, 11 a.m. – 4 p.m.
November 1 to April 31, Saturday and Sunday, 11 a.m. - 4 p.m., weather permitting. Admission charged. Donations accepted. Tours by appointment. Location: Tracks 1 and 2 at VIA Rail Station, 123 Main Street.